This trip marks our ninth visit to Hong Kong. Shopping was the name of the game back in the day, but our visit this time is all about seeing what’s new and what’s stayed the same. After a day of rest yesterday, today we headed out to see some of the places we loved to visit in the past, and also eat at some of our favorite Hong Kong restaurants. Our first stop though was the customer service booth at the Tsim Sha Tsui subway station, just a short walk from our hotel, to purchase the convenient, multi-use Octopus cards which are good for the subway, buses, trams, ferries and other forms of transportation around Hong Kong. Seniors over 65 receive a 50% discount on the Octopus Card, a big savings for us. We paid a $50HK deposit for each card that will be returned when we turn back in the cards at the end of our stay. Every time we use the card it not only shows the cost, but how much we have remaining (we bought $20HK worth of fares), and cards can be reloaded as necessary at machines in all subway stations. 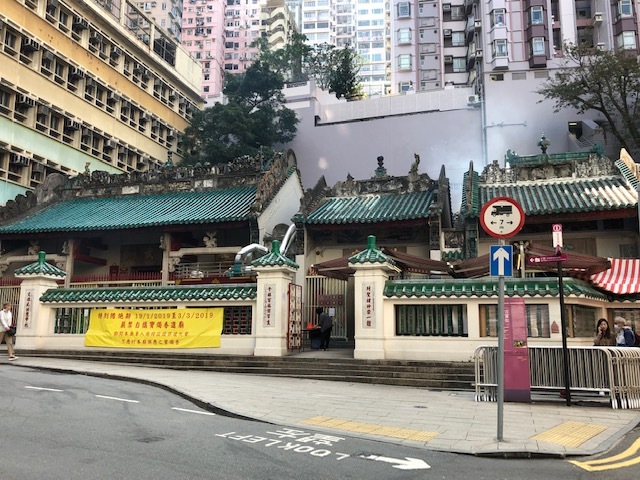 From Tsim Sha Tsui we rode over to Central and walked to Man Mo Temple on Hollywood Road in Sheung Wan. 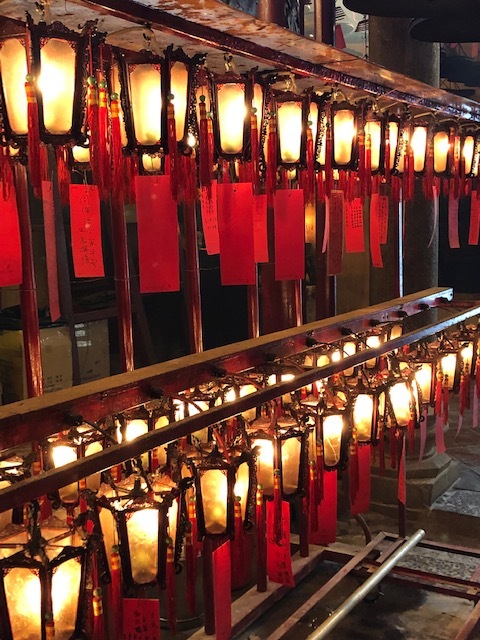 The temple was built in 1847, and is dedicated to the worship of several Chinese gods. 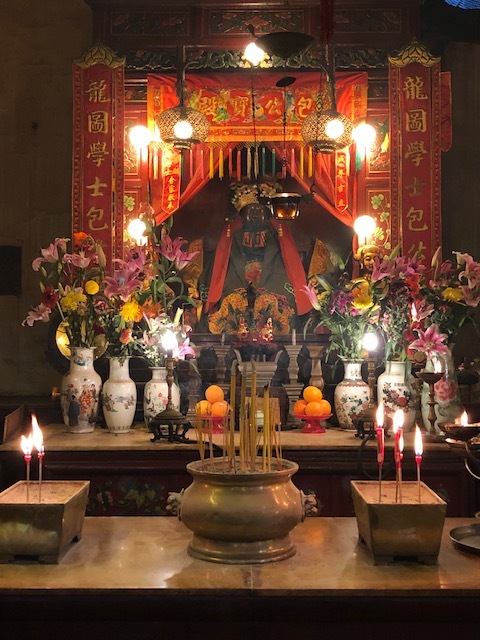 There were many people worshiping at different altars in the temple when we visited, lighting incense, praying, and leaving gifts of tangerines at the altars. Candles were also burning throughout the temple and visitors are warned to be careful around the open flames. One of thing we have always enjoyed experiencing at the temple are the huge coils of slow-burning incense that hang from the ceiling. Although we understood little of what was happening in the temple, it was still a place of great beauty and reverence and we stayed a while to take it all in. One of several altars inside the temple. Rows of lanterns filled one section of the temple. Leaving Man Mo Temple we wove our way down through Central’s narrow streets and lanes to our next stop: Tai Cheong Bakery, where we purchased a few of what are considered the best egg custard tarts on the island. Delicious is not an adequate enough word when it comes to describing these tarts – they are luscious. Tai Cheong Bakery’s custard egg tarts are simply luscious. They’ve been a favorite in Hong Kong since 1954. 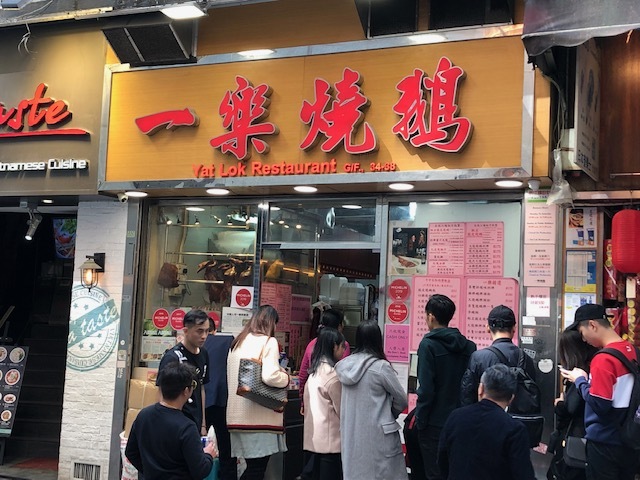 At Yat Lok restaurant there’s always a line outside. Then it was on to lunch at Yat Lok restaurant. This little whole-in-the-wall restaurant serves one thing only: roast goose. But not just any roast goose – their preparation has earned them a Michelin star several years in a row. As expected, there was a line outside the restaurant when we arrived, but there was immediately a call for two people and since Brett and I were somewhat unexpectedly the only couple we were taken right in! 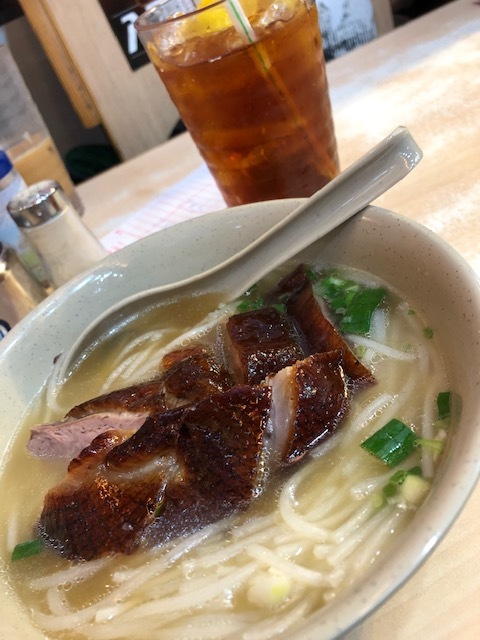 We each enjoyed a bowl of noodles in tasty broth topped with goose along with a BIG glass of lemon iced tea. The cost for this absolutely delicious, Michelin-rated lunch? Just $10US each. Noodles with roast goose – simple and beyond delicious. 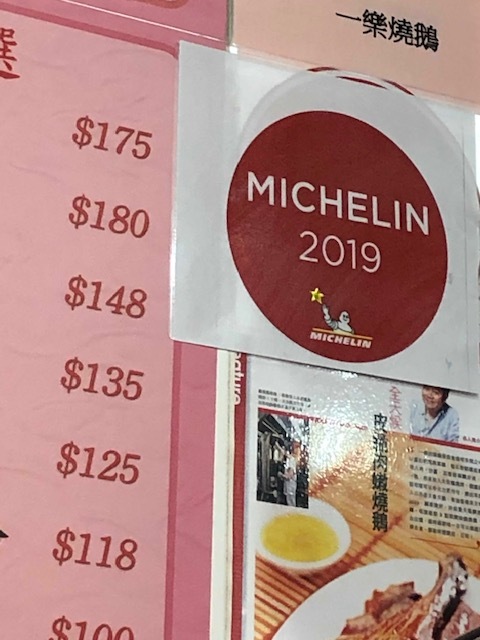 Yat Lok’s 2019 Michelin star – they’ve earned a star for the past four years. 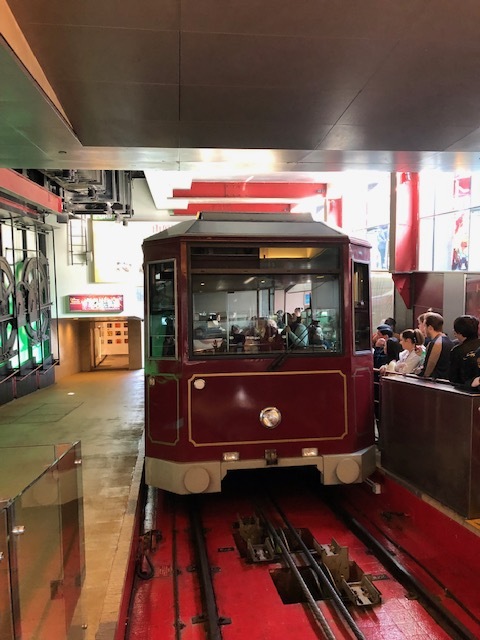 With our bellies full and happy, we next walked over to the Peak Tram for a ride up to the top of Victoria Peak, not only to take in the view and but also to have dessert at the historic Peak Lookout Cafe (formerly the Peak Cafe), one of our favorite places to dine. The line to board the tram was long, but it moved fairly quickly and before we knew it we were heading up the through the high-rise apartments that cover the side of the Peak. 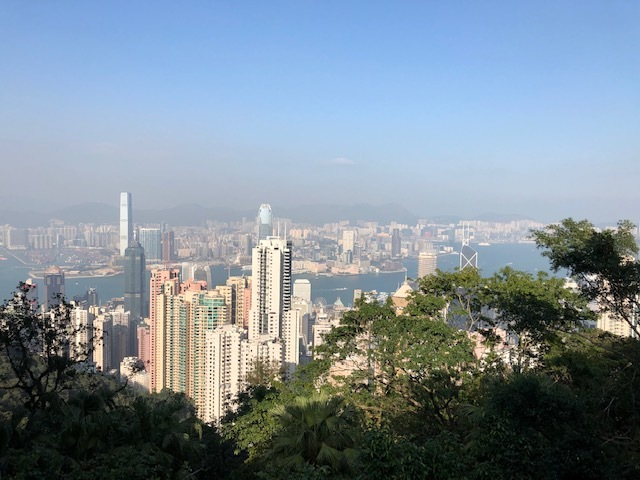 The Peak, as always, was very crowded at the top, but we found the Lookout restaurant and were seated outside where we enjoyed a delightful cool breeze and a view of Repulse Bay and Stanley. After our dessert we walked over to take in the view of the harbor and Kowloon before getting in line to head back down to Central. 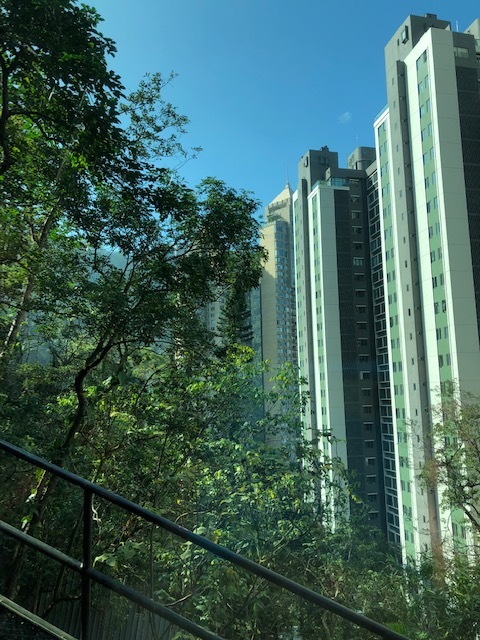 The Peak Tram climbs through rows of high-rise apartments that cover the side of Victoria Peak. The view from the tram near the end of the line. 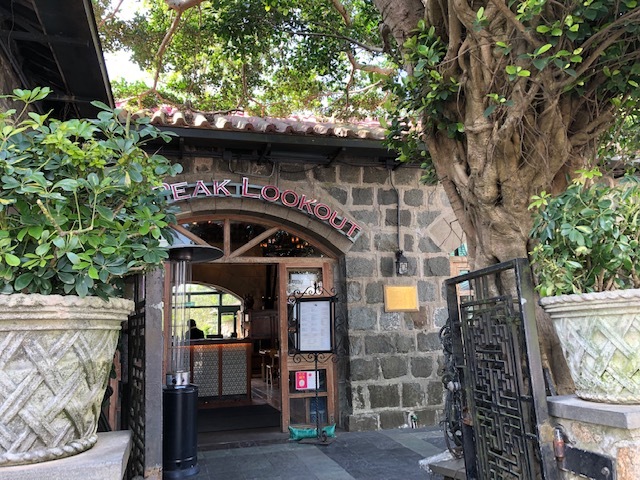 The historic Peak Lookout Cafe was originally a temporary resting place for sedan chair carriers and then later transformed into a permanent shelter. It began catering meals in 1947 and was known as the Peak Cafe for many years, one of our favorite places to dine. The tram to take us back down arrives at the end of the line. When we got to the bottom, the line of people waiting to go up was almost twice as long as it was when we went up. After returning to Central we caught a bus to the Star Ferry terminal to get back to Tsim Sha Tsui. 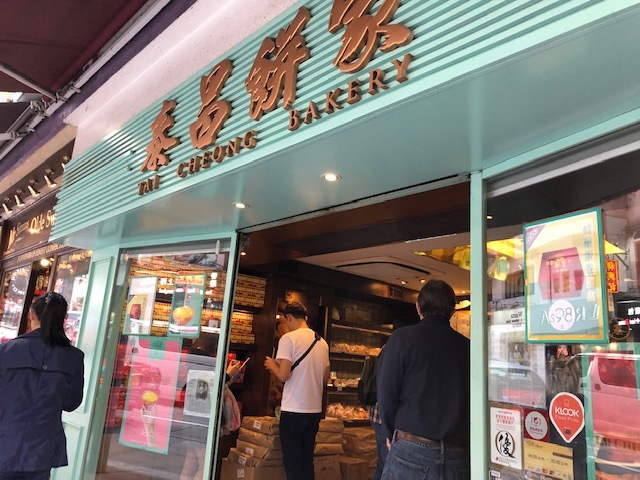 After our arrival on the Kowloon side, we headed to Watson’s Drugstore to pick up a bottle of water and a small bottle of White Flower Embrocation, a Chinese medicinal ointment that can be used for many ailments. We then headed into the massive Ocean Terminal mall to have an early dinner at one of our favorite Hong Kong restaurants, Paul Ryan’s Chicago Grill. Ryan’s serves All-American food (burgers, steaks, etc.) and Brett and I ate at least one meal there on every trip to Hong Kong. This time he and I shared a big Reuben sandwich, which after everything else we’d eaten earlier in the day was more than enough. We were thrilled to be given Ryan’s keychains once again as we left the restaurant, a favorite tradition from our past visits (and we actually still have some of those keychains from 30+ years ago!). 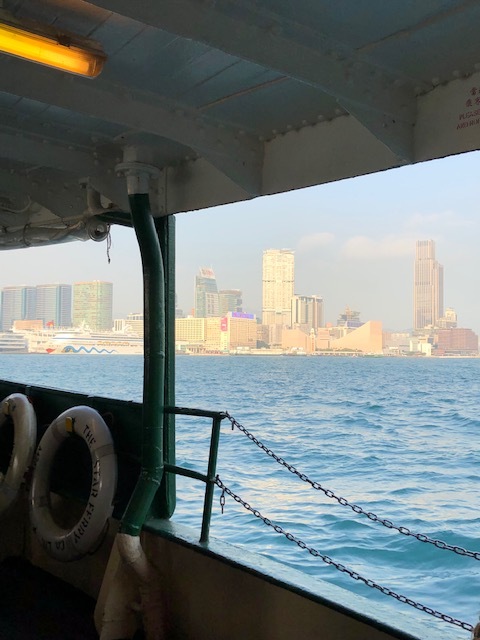 A visit to Hong Kong is not complete without a ride on the Star Ferry, in operation since 1888. 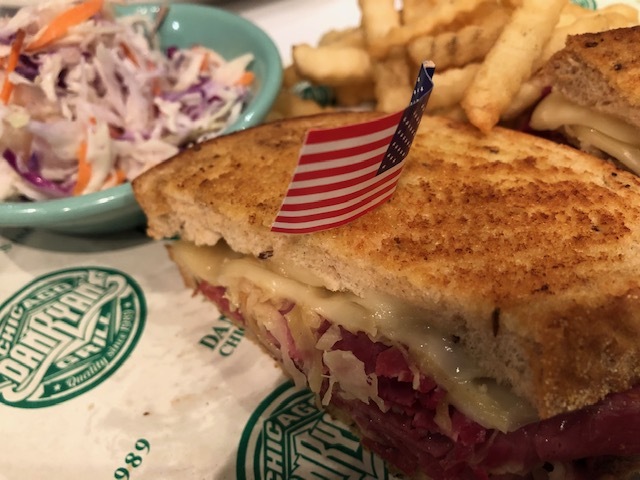 Dan Ryan’s Chicago Grill makes a very delicious Reuben sandwich! 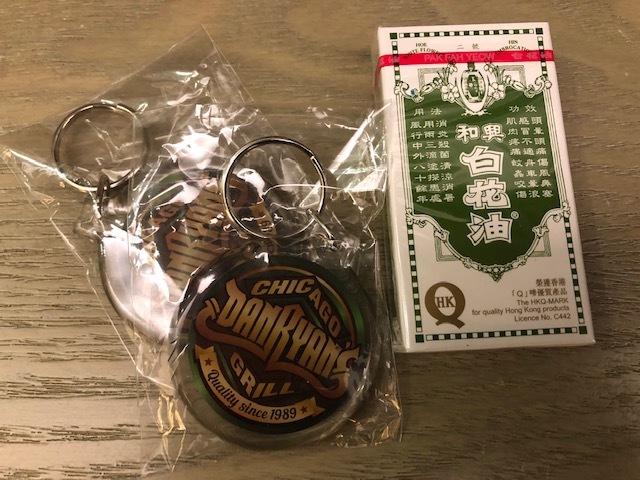 Dan Ryan’s keychains and White Flower Embrocation – the perfect Hong Kong souvenirs for us! We walked over five miles today (nearly 15,000 steps for me – yikes! ), but we had a wonderful, nostalgic time and ate some amazing food. Tomorrow though will be all about something new – we’re going out to Hong Kong Disneyland for the day! Our Dan Ryan keychain is still used for our house key. Thank you for the pictures. I could, almost, smell the incense. Will enjoy hearing about Disney. My last visit to Lantau was on a junk and the island was much like hiking in Kauai. Brett had just recently given our last one to our oldest daughter (because he isn’t carrying keys any more), so we were thrilled to get new Dan Ryan’s keychains. The color scheme is a little darker, but they otherwise look the same. Hope they last as long too! Everything is so built up here now – it’s pretty amazing. But we’ve been happy to find that many of our old favorite places have remained the same, or at least similar. Afternoon tea tomorrow at the Peninsula! Went to HK on the way back from a business trip to Thailand 20 years ago. Had a great time. Are you doing afternoon tea at the Peninsula? Was traveling with a few business friends and, as I remember, this was a great way to cap off a day on our feet. We are going to tea tomorrow at the Peninsula! It has long been on my bucket list, and we are meeting a good friend from Portland who is in town for the Chinese New Year (she was born and raised here, and most of her family is still here). 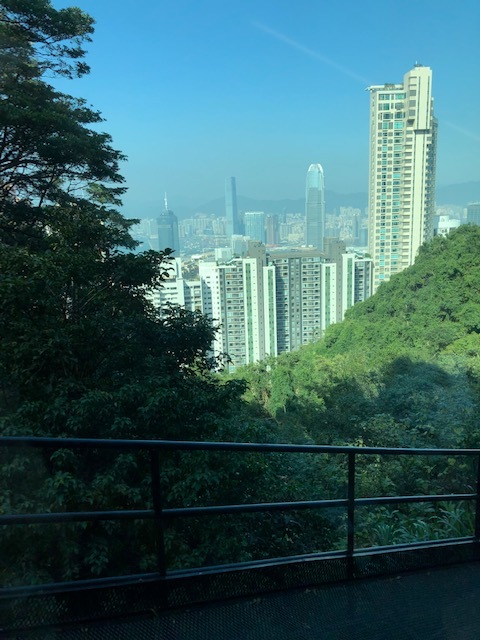 Hong Kong remains one of my favorite cities in the world – we’re having a wonderful time getting reacquainted as it’s somewhat different than it was 20 years ago, but not completely. Don’t think I could handle walking 5 miles in one day but I know you prepared in Hawaii before you ever left on this journey. Would all your walking have been possible if you had not practiced ahead of time? You;re right about the prices. Some seems reasonable but the costs of laundry, do they have laundry mats there? Are they any cheaper? We were shocked to see how much we had walked by the end of yesterday, and we walked almost as much again today on our visit to Hong Kong Disneyland. My feet hurt tonight! Walking so much back in Hawaii did help, but we didn’t walk the whole month we were in Portland because of the weather and distances we needed to go. The walking in India wasn’t too strenuous, so it got us a little bit back into shape a bit before coming here (thank goodness). Some things are very inexpensive here, other things not so much. Our tickets into Disneyland here were just $13US each! That doesn’t happen in the U.S. Food yesterday was very inexpensive, and good. Don’t know about other places to do laundry here, but I KNOW prices probably anywhere else are lower than here at our hotel! I was exhausted reading about your day!!! You two certainly make the best use of your time 🙂 I was curious about the Disneyland ticket price in Hong Kong, since they recently raised rates, thanks for the answer… Since you are in a hotel, do you limit your meals to twice a day? It was a long, but very fun day, but it sort of made yesterday’s visit to Disneyland a bit more difficult. We walked a lot there (over 12,000 steps for me) and I was exhausted and sore when we got back to our room. Yes, we only do two meals a day when we’re in a hotel. We have a pastry and coffee for breakfast (make coffee in the room), and then eat a big lunch. No dinner, although we usually pick up a snack somewhere – my favorite here is a big fruit cup! I put weight back on when we were in Portland, so am trying to get some of it back off!